Scrabble used to be the only letter-tile game in town, but a decade ago, Bananagrams entered the playing field, and it’s quickly become one of the most recognizable names in puzzle gaming. And I’ll let you in on a little secret: while I’d known them by reputation, I’d never actually played a round of Bananagrams. So when presented with the opportunity to try out the newest member of the Bananagrams family — Bananagrams Wild Tiles — I was definitely looking forward to putting my puzzly skills to the test. 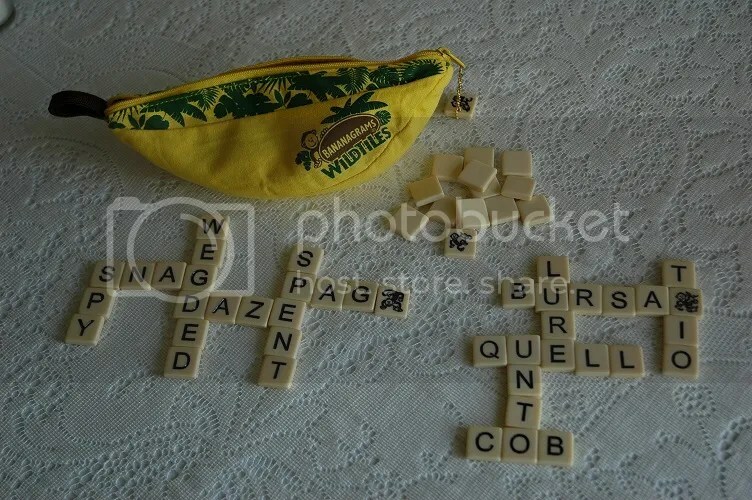 For those unfamiliar with Bananagrams, it’s a word formation game with a sense of urgency and freedom. Your goal is to use all the tiles in your hand to build words that cross and interact as they would in a standard letter-tile game, but with no board to restrict the words. And your opponents are building their own grids at the same time. It’s a race to complete your grid by arranging and rearranging the letters, putting your vocabulary and anagram chops on display. Bananagrams Wild Tiles offers a spin on the familiar Bananagrams formula — there are six Wild Tiles, depicting the Bananagrams monkey mascot, and these tiles can represent any letter of the alphabet. That’s right, these are six get-out-of-trouble free cards in monkey tile form. This seems like a minor change, but it makes a major difference in gameplay, since one Wild Tile can add serious adaptability to your hand, upping the stakes. Bananagrams Wild Tiles is a perfect gateway game to introduce puzzles both younger and older who might’ve been put off by the more rigid, more intimidating aesthetic of Scrabble. With its lighthearted packaging, free-form gameplay, and endless replayability, this one is a winner. This entry was posted in Games, PuzzleNation, Puzzles and tagged bananagrams, Bananagrams Wild Tiles, bananas, games, Geeking Out, Holiday Gift Guide, letter tile, monkey, Pop culture, product review, PuzzleNation, Puzzlin' fool, Rena Nathanson, Scrabble, tile game, Wordplay by gmdirect. Bookmark the permalink.